The release of the all-new 2014 Toyota Corolla is just three days away but Toyota isn’t done teasing us yet. See the three new features they have released. When we brought you the last teaser image of the front end on the all-new 2014 Toyota Corolla last week, we had a feeling Toyota wasn’t done with teasing us. And the hunch was right because Toyota released more images on their Facebook page that give us a few more ideas as to what is coming for the new Corolla compact sedan. This time we get a look at the new Corolla’s LED headlights, new front end styling, a touch screen audio unit and the 17-inch two-tone alloy wheels. Toyota is giving Corolla fans a chance to vote on the sneak peak images of the all-new Corolla. Fans can check out the exclusive teaser images of the features that will be available and can cast their vote for their favorite one. After voting, you can check to receive updates via email on the new 2014 Corolla. Toyota is certainly getting the most mileage they can before the 2014 Corolla’s official release on Thursday. Toyota is updating the new-generation Corolla significantly over the outgoing model and are telling us to get excited. Toyota says the new sedan is going to be completely new both inside and out. 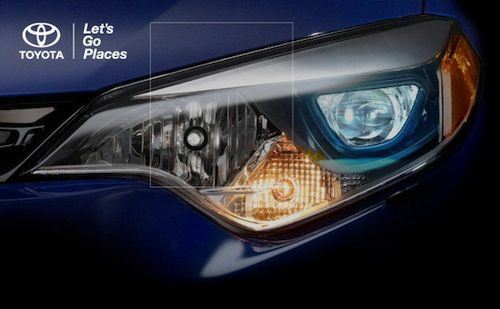 The new image of the headlight reveals a new triple-lense configuration, and according to Toyota, LED technology is available for the main beam for the first time. This is a major upgrade and an unusual feature in the compact segment. In the first teaser released back on May 31, we see that Toyota will be releasing the new Corolla as an ‘S’ variant here in the U.S. The new red S badge that appears on the rear tells us the package will be sporty and will include a number of features that should make the small compact sedan much more sporty and dynamic than ever before. This blue car being teased as the ‘S’ variant will have a much more stylish and contemporary look than ever. The all-new 2014 version will also feature stylish 17-inch two-tone alloy wheels that replace the boring 5-spoke alloy wheels on the 2013 model. Inside, the new-generation Corolla will come with new technology that will feature a new touch screen audio unit. As we reported last week, the new compact sedan will be powered by a 1.8-liter engine that features the latest fuel-saving technology. The 2014 model is expected to top 40 mpg with the newly updated Continuously Variable Transmission (CVT). While it would be a great improvement with a five-speed automatic, it looks like the 2014 Corolla will still have the four-speed automatic gearbox.